that lasted approximately 0.8 seconds. We conducted a number of experiments, deliberately trying to create flashbacks in order to a) film them for the benefit of new owners of ceramic charcoal cookers to make them aware of the dangers and b) discover what might contribute to the strength of flashbacks. What is a flashback? Basically, a flashback can occur when you have a hot fire in the cooker, you cut off the air supply to the fire for a period of time, and then you open the lid allowing oxygen to enter the cooker. The fire is starved for oxygen, having consumed all the oxygen in the cooker while the air supply was cut off. When the lid is opened and oxygen rushes back in, a flashback can occur if there is fuel and enough heat to ignite the flashback. For example, this often happens when cooking steaks using a high temperature sear followed by a dwell. Typically the steaks are seared over a 750 degree fire for several minutes, then the air vents are closed for a "dwell". When the dwell is finished, the lid of the cooker is opened to remove the steaks. 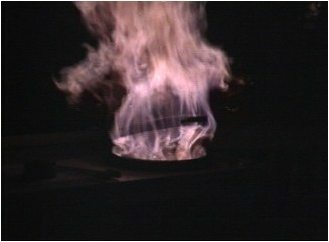 The flashback can occur when the lid is opened after the dwell and air rushes into the oxygen starved fire. However, flashbacks have been known to occur at lower temperatures under different conditions. 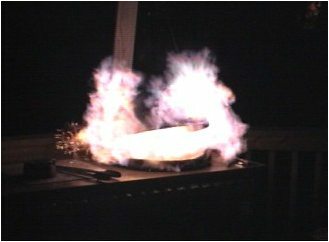 As the experiments will demonstrate, though, there are 3 factors necessary: lump containing volatile organic compounds (VOCs), heat, and a sudden supply of oxygen to a oxygen-starved fire. "I would encourage you to refer to it as a backdraft, because that is what you created. Many laypersons are vaguely familiar with it due to the movie Backdraft. As a firefighter, I know a backdraft is a situation where a fire develops in a closed compartment, space, room, whatever....the fire builds, temperature rises and fuel is being consumed until the fire uses up the oxygen in the space. At this point the open burning stops. The heat is still present as are the fuel load and other combustible gases. Now, along comes a firefighter or a backyard chef and open a door, window or other opening. Oxygen rushes in. The other 2 components needed for fire are already there (the heat and the fuel). This results in massive eruption of the unburned fuel and gases lingering there. Voila...Backdraft. Same thing firefighters must be wary of. Except in our case, walls could be blown away, structural collapse, deaths, etc.. I only tell you this to help turn the light on in a few more peoples head." As described above, when cooking steaks using a high temperature sear and then closing the air vents for a dwell. Flashback can occur when you open the lid after the dwell. When cooking at lower temperatures with fresh lump that is all pretty small pieces. Airflow through the fire isn't adequate for complete combustion of the volatile organic compounds that are driven off from fresh lump. The VOC's build up in the cooker and lifting the lid can create a flashback as more oxygen is allowed into the cooker. UPDATE: Flashback can occur on the mini, small, medium and large models of the Big Green Egg. We would have to assume it can occur on similar-sized ceramic cookers from other companies. There have been statements made on the BGE forum that flashback cannot occur on small or medium cookers, but this is NOT true. We have personally experienced flashback on the small, medium and large cookers. We have also been informed by mini-owners that they too have experienced flashbacks. The Experiments: We started our experiments by adding a small amount of new lump to our cooker to supplement the lump that was left over from a 600 degree fire to cook a pizza. 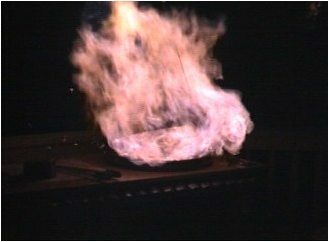 The lump was almost up to the top of the firebox. We started the fire and let it get to 750 degrees. WARNING: If you don't watch the video of the experiments, you should know that we opened the lid of the cooker by tying a rope to the handle, running it through a pulley overhead and across our deck. We were 15 feet away whenever we opened the lid. We don't encourage anyone to try this at home. We closed off the air vents and let the cooker sit for 4 minutes. We opened the lid and got a small pitiful flash. We added a couple of handfuls of small chunks of wet oak, allowed the fire to return to 750 degrees and shut off the air for 4 minutes. Much smoke was being generated. When we opened the lid, volumes of smoke poured out, but we got no flashback at all. Zero. We allowed the fire to return to 750 degrees, closed off the air supply for 6 minutes and opened the lid. By this time, the smoke was gone, the chunks having burned up. Again, no flashback whatsoever. We added 4 pieces of fresh lump to the fire, allowed it to return to 750 degrees, cut off the air until the temperature dropped to 500 degrees (about 2.5 minutes) and opened the lid, and again nothing. We added a large amount of fresh lump (probably equal to what was already in the cooker, bringing the lump up above the top of the firebox), allowed the fire to return to 750 degrees, shut off the air supply for 3 minutes, opened the lid and WHOOMP! (That's the technical term for "We got a real good flashback".) We repeated this, shutting the air off for 4 minutes and got another mighty flashback. Conclusions: Based on what we just observed, old lump that has been heated by a previous fire will not create much of a flashback and smoke alone is insufficient to cause flashback. The key factor is the "freshness" of the lump. 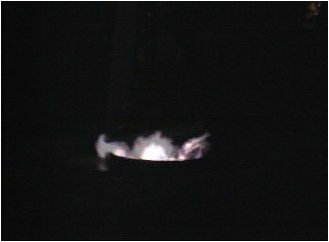 If you observe a hot fire made with lots of fresh lump, when the fire is at 700 degrees or so, you will see blue flames spouting from the top opening, jumping 12 to 18 inches. If you do this with old lump that remains from a previous hot fire, you will see very little (if any) of the blue flames. Why? Even though lump is mostly carbon, it still contains a certain amount of volatile organic compounds. These VOC's are driven off by the heat of the fire and can then burn. 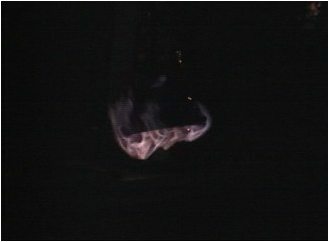 This is the blue flame you see spouting from the top of the cooker. So, when the lump is fresh and still contains a significant amount of VOC's, VOC's build up in the cooker while the air supply is shut down. Opening the lid allows oxygen into the cooker which allows the VOC's to ignite and the result is the flashback. 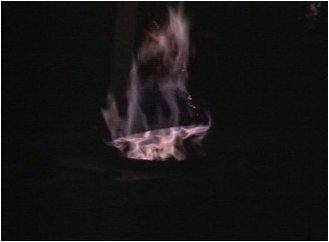 Lump which has been heated in a previous hot fire contains a lesser amount of VOC's and thus the severity of the flashback is greatly reduced. Eventually as the lump continues to burn, all the VOC's are driven off and no flashback will occur since there are no VOC's to ignite when the oxygen rushes in. The determining factor on the size of a flashback is the amount of VOC's in the lump. Remember, Fresh Lump = Highest Amount Of VOC's = Biggest Flashback = Greatest Danger. But also remember, you can never be really sure as to the amount of VOC's in your current fire, so always be careful! UPDATE: We recently experienced a flashback with lump that had been burned a cumulative total of over 30 hours in several sessions. This is a new lump (see the review of Wicked Good Charcoal at The Lump Database) which lasts a very very long time. Apparently this lump contains VOC's even after repeated lengthy burns. So let us emphasize that you can never be sure whether or not you are going to have conditions conducive to flashback, so whatever procedure you use to avoid it, use it everytime. Instead we recommend that you open the bottom vent and the top vent all the way for about 10 seconds before you open the lid. The lid should then be opened slowly about 1 inch for a few seconds and then the lid can be opened all the way. This allows most of the hot gases to burn and exit the cooker before you open the lid and expose the gaskets. This is the original movie we made way back when we only had primitive equipment for recording and editing. (You can see our modern updated movie below!) We videotaped the flashbacks which occurred during our experiments and selected the best one to make into a small video so that you could see a real flashback for yourself. We hope this will motivate you to be careful with your cooking. It is now nine years later and a lot has changed in the way of video technology and software. It's time for an update. We present here the newest version, Flashback HD!